The basic principle of medicine is that if you do not use your muscles, they become weaker. Like any other muscle, it is necessary to train the eye muscles to be healthy. We reveal some easy ways to do so. 1.Avoid eye strain during the day. Every 2-3 hours, close your eyes for a few minutes and enjoy the peace. 2.If you wear glasses, reduce their wear to a minimum and make sure that you often take them off. 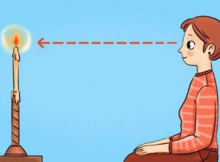 3.Massage your eyes in a gentle circular motion. Move your fingers from point 1 to point 6 as shown in the image. Use the middle finger and index finger to press the eye. You should feel a slight pressure, but not pain, when you do this. 1.When you’re out for a walk, try to look as far as possible in the horizon and also you need to avoid looking directly in front of you or at your feet. 2.Try these simple eye exercises and do them every day. 3.Drink carrot juice as often as possible (it is advisable to drink it every day). 4.When your eyes are tired, wash them with warm water. 5.Try not to look too much at the computer monitor, TV or phone at least 2 hours before going to bed. 6.Try the Indian Trataka exercise for the eyes. This will help your mind and eyes to stay focused. Sit directly facing the stationary object in the open position (candles, for example). Concentrate your view towards the subject. For achieving the goal you should have a clear and detailed picture in your mind and memory.